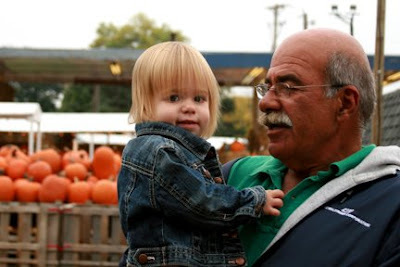 Yesterday we went to an apple orchard/pumpkin patch. 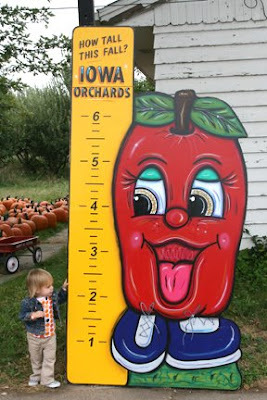 We had to re-visit the 'how tall this fall' apple. Look here to see how little she was last year. She looks so tall now! Took lots of cute photos of the L and her little cousin, Oliver. They're pretty good buddies and they make quite the pair. Also yesterday, the L said 'thank you' - 100% on her own. Without any prompting. I always ask her to say thank you throughout the day, but yesterday morning, she woke up (earlier than we would have liked) and so we stuck her back in bed with us and flipped on the tellie to SpongeBob. (In case that might allow us to sneak in a few extra zzz's or at least gradually ease ourselves into our Sunday morning. We will take what we can get.) Anyway, Bo pulled up the covers over Lo's legs and she said 'thank you!' Pretty sweet. And amazing to see her learn so quickly. 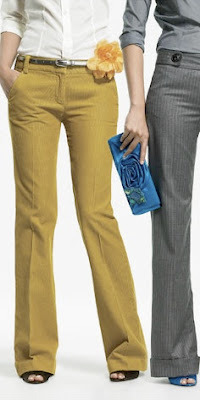 Scored some incredibly yellow pants from J. Crew (not this exact shade of yellow, but close) for $12.99 on sale. I was asking the sales girl what colors I should pair with the yellow (because all I could come up with was gray or navy) and she said that this fall, it's all about cream. Who knew? And how amazing is that blue clutch+shoes with gray? Worked on the very first part of Steady Hand Faulty Heart. Which I meant to do during the summer months, but it works equally well for fall. I was excited to use a real leaf. (And the tag from my tea, pieces of a Fossil bag that I've been saving forever, and some pretty yellow lace trim that I got in a RVKC kit awhile back.) I'm having a blast with this and hope to work on more pages this week. Like a bunch more. 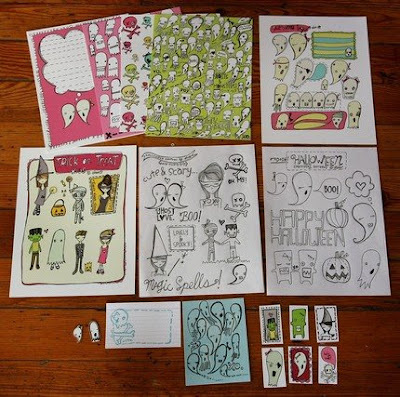 Couldn't resist this totally rad Halloween crafty kit from Elsie. I mean, there's so much to love. Hand-illustrated shrinky-dink ghosts, embroidery patterns, felt ghost garland patterns, and the cutest Halloween craft paper I've seen yet. You guys are up to all sorts of fun! 1. 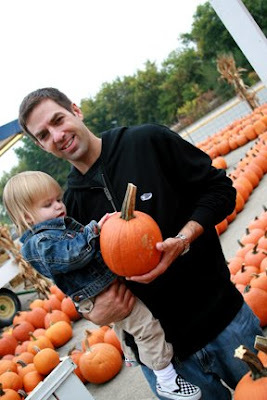 Lotus is ridiculously cute--love the pumpkin pics. 2. What a score on the yellow pants. They rock. 3. Love love love your fall page. Beautiful work! What talent you have. and yes. kinks are my bestfriend!!! Very cool layout! I saw those kits on Elsie's etsy, so neat that you got one. Can't wait to see what you do with all that goodiness. Your mad skillz never cease to amaze me. And if the fall freelance project is the one I saw, it's killer. Pretty much you're a creative genius! :) I don't think my apple crisp is worthy!! I love those pics! 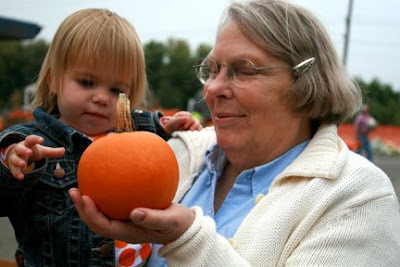 We are going to the pumpkin patch next week! I hope to get some cool pics too. Love your aj page! Yay for "Thank-yous!". 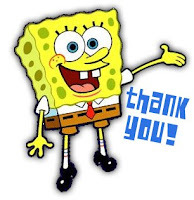 There should be a cute Spongebob picture like that for eveyrthing...he he. 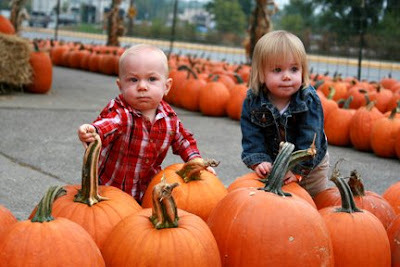 :) Such cute pumpkin pictures, too! 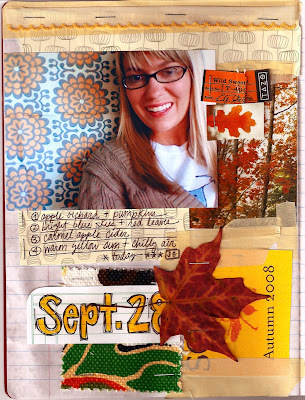 And the art journal, Oh my...happy day!